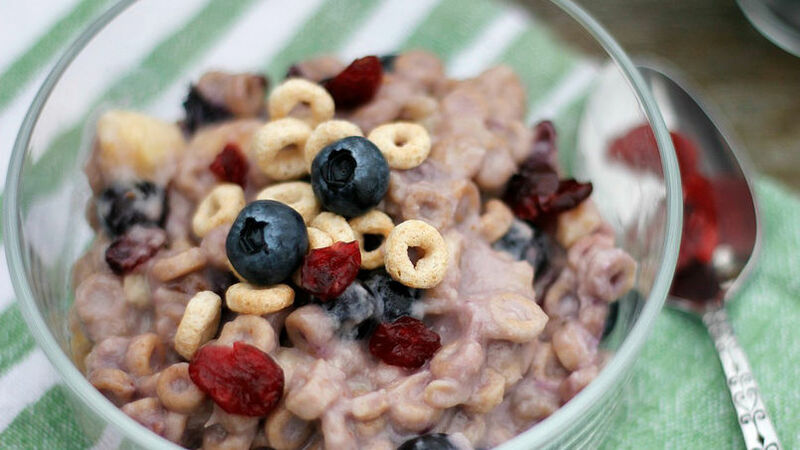 In a microwave safe bowl, combine 1 cup Cheerios™, 1/4 cup blueberries, half a banana, 1 teaspoon of chopped walnuts, 1 tablespoon of cranberries and 1/4 cup of skim milk. Warm the mix in the microwave for 40 seconds, remove to stir all the ingredients and heat up the mix for an additional 40 seconds, or until the cereal and fruit is soft. Remove the bowl from the microwave and let the mix rest for a few minutes. Finally, add a spoonful of Cherry Orchard Yoplait™ yogurt and serve immediately. You can use any other flavor of yogurt, such as vanilla or blueberry. This compote has the perfect amount of sugar for my taste, but if you would like it a little sweeter, just add an extra teaspoon of cherry yogurt. I remember a few different occasions in which my mom prepared a bowl of hot oats when I was little. And you could say that the memories I have of these breakfasts are not very good. I never liked the consistency or the flavor of the hot cereal, and it’s not that it was bad; rather I feel that it wasn’t a very appealing dish for kids. However, now that I’m an adult, I have to recognize that eating oats is considered by many, among other benefits, an excellent way to help maintain low cholesterol. For this reason it’s important to incorporate them as part of a daily diet. Thanks to Cheerios™, now I can prepare hot oats, and my children always enjoy a bowl of cereal in the mornings. The compote that I present to you today is a different and fun way to offer my family a nutritious breakfast, especially on those “on-the-go” days. I will only take a few minutes of your time, and in turn you will provide, in just one meal, oats, fruits, nuts and protein to start the day off well.